Your auto case value is affected by the courts and counties where you are permitted to file the lawsuit. The reason is that (1) some courts have different limits on the amount of money you can recover; and (2), in general, the decision makers (judges and juries) have attitudes toward personal injury cases that makes them more or less likely to give a favorable verdict. You might wonder why the court, judges or jury matters–after all, if you are seeking a Maryland car accident settlement, you won’t go to trial, right? Well, it matters for a couple of reasons. First, not every case settles. Sometimes the other side will deny that they were negligent, or they will deny that their negligence caused you harm, or they will claim that your injuries (damages) are not as extensive as you think they are. If they won’t settle your case for what you think it’s worth, the only other choice you have is to file a lawsuit. Second, even if your case will settle before a lawsuit is filed, the insurance adjuster should know about where you can file suit. Savvy adjusters will understand that the value of a case that can be filed in Prince George’s County is likely higher than a case that can only be filed in Allegany County. That adjuster’s perception of the attitudes of the decision makers will reflect the value they place on your auto collision case. So, let’s talk about the courts. There are three different types of courts in Maryland where you can file a personal injury lawsuit. 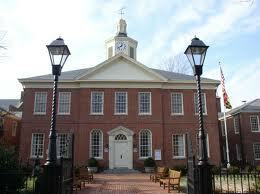 The workhorse of the Maryland court system, most personal injury lawsuits are filed in District Courts. There are three levels of recovery: $5,000 or less (small claims), $15,000 or less, and $30,000 or less. As the plaintiff, you would have the option of deciding what level to file at. It does not guarantee that you’ll get one of these amounts–only that your recovery cannot exceed the amount you filed for. There are important tactical decisions for filling for each of these amounts, which we’ll cover in a different post. These cases are always decided by judges. Circuit courts have no maximum recovery, other than the legislatively-imposed non-economic damages cap (or amounts agreed to by the parties). These cases can be decided by judges or juries. Personal injury cases are typically filed in federal court where the cases is worth more than $75,000.00, and the parties are from different states (called diversity). Diversity is complicated and has many nuances, but it is important to note that Federal courts are subject to the same limits as circuit court cases–the non-economic damages cap applies. It is important to compare your court options when evaluating the value of your Maryland personal injury case. In any specific case, it is impossible to say what a judge or jury will do–it depends on the facts, the witnesses, and the evidence. However, in the aggregate, it is possible to compare the typical verdicts. An experienced lawyer will be able to decide the best place to file when there are multiple options. For example, when comparing circuit courts, plaintiffs’ lawyers generally prefer Baltimore City and Prince George’s County over the other counties. This is because experience tells us that Baltimore City and Prince George’s County juries a generally comfortable in rendering high verdicts, when the situation allows for it. However, when looking at district courts, some plaintiff’s lawyers are reluctant to file in Baltimore City, arguing that many judges there don’t think favorably of general “soft tissue” cases with physical therapy or chiropractic care. This is of course a generalization, and there are indications that the attitudes of Baltimore City district court judges is changing for the better. The rules generally make it easy to know what county your case can be filed in. Typically, it can be filed in the County where the accident happened, or where the negligent driver lives. If the negligent driver is a business, it can be filed where that business has its principal place of business. Clearly, before you or your lawyer starts to negotiate your case, you should have an idea about where the case can be filed. This will help you negotiate the highest possible settlement with the adjuster, who should know that the value of your case changes based on where the case could be filed.